Ravelry can be both a curse and a cure. 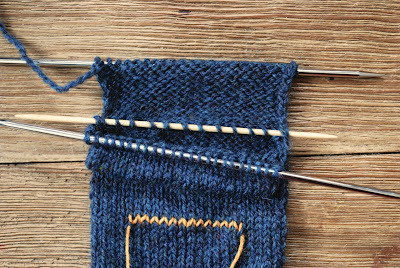 Easy, instant access to a world of knitting patterns is great; however, the number of patterns available can be overwhelming at times. A few days ago I was browsing on Ravelry - clicking and adding to my queue with reckless abandon. Time has a way of evaporating when you're on Ravlery. Finally, after much debate, I settled on a pattern. 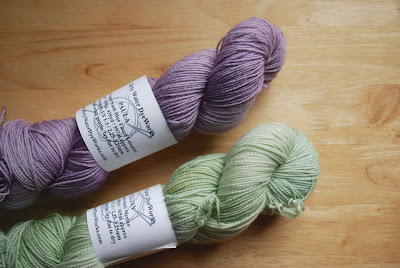 I'm having a spring fling with a couple of new colorways and chose Picabeau for a skein of Paula Orchid. This colorway isn't on the website yet. Give me a few days. Paula is 100% Superwash Blue Faced Leicester - smooth, lustrous, almost silky. I love working with it, and this time around is no exception. Picabeau has two sections - an increase section and a decrease section. The increase section is made up of 8 16-row repeats. I finished the 8 repeats and then paused. 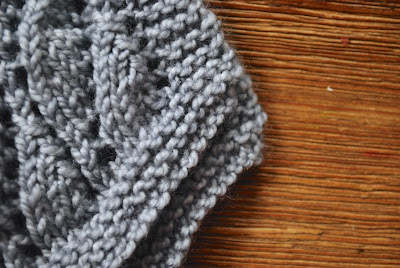 At this point the pattern has the option of working additional repeats until you've used half of your yarn. 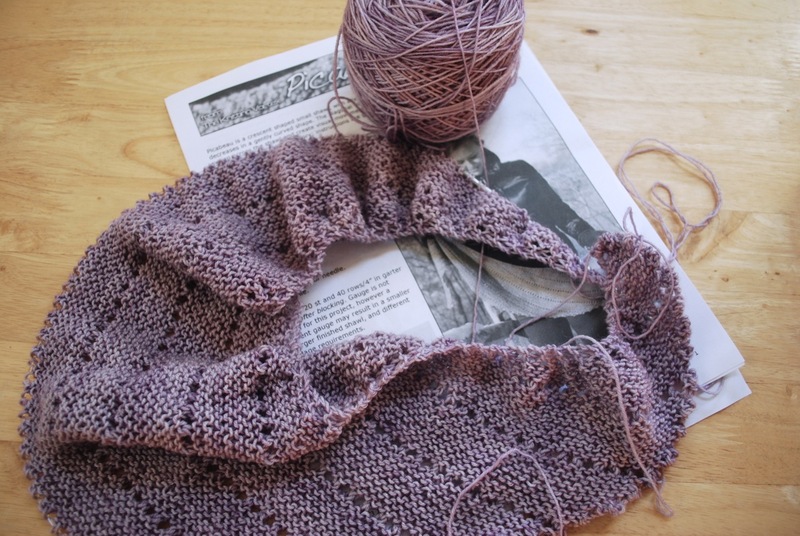 Did I want to make the shawl a little bigger? Did I want to use as much of the yarn as possible? The answer was yes. I'm a terrible judge of how much is left on a ball of yarn, so I put it on the scale. It weighed in at 63 grams. Since I started with 100 grams, I still have a few grams to go. I don't want to cut it too close, so I'll stop when I get to 52 or 53 grams. It's less stressful on the other end if I have a little cushion. My color inspiration this week is in keeping with the season. 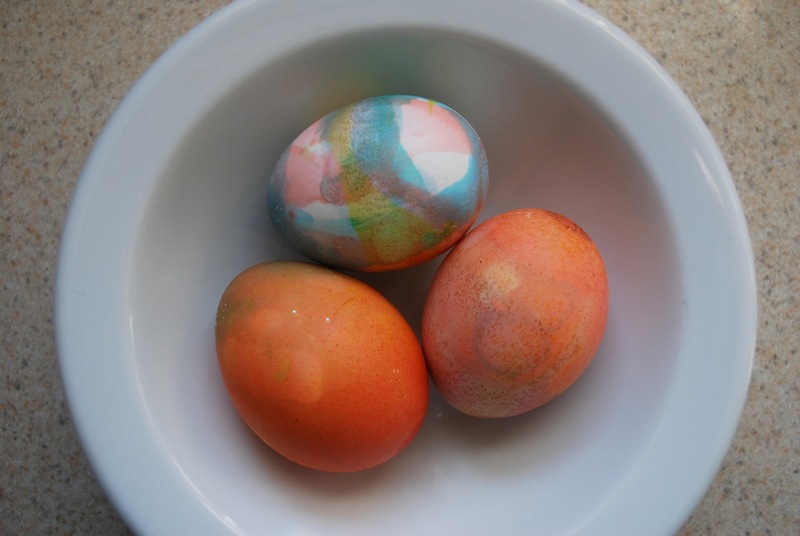 Dyeing eggs can produce subtle color shifts and variations. Last weekend I came home from my day trip to Portland feeling inspired to work with spring-like colors. Many of the knitters who came to the yarn tasting were searching for a hint of spring - something cheery, something to chase away the remnants of winter. I find it interesting how the seasons affect our color choices. Many times people choose colors to match the season - rich, intense colors for fall and winter; light, bright colors for spring and summer. I guess it's no different than the way people eat with the seasons - heavier foods in fall and winter, lighter fare in spring and summer. I went in search of spring-colored yarn and may have gone a bit overboard. 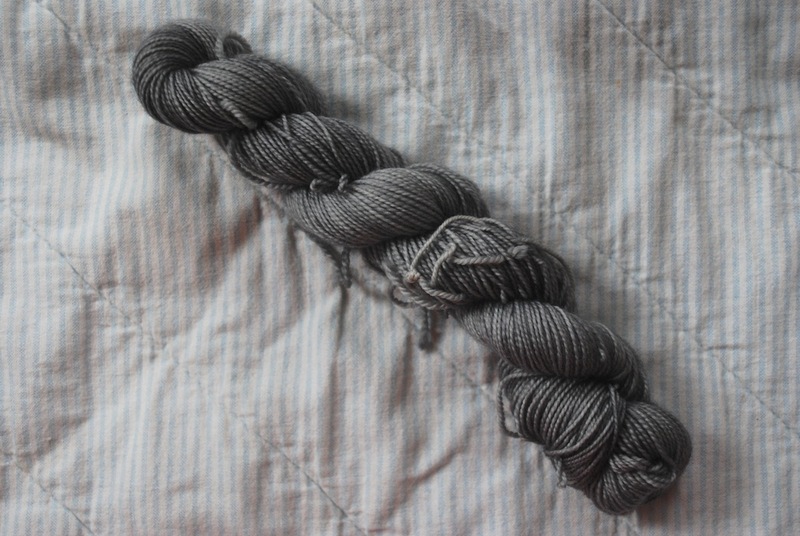 I had half a dozen skeins that were all calling me. It was time for my quirky selection process - a combination of what colors haven't I worked with recently and what colors do I really like right now. In the end I narrowed it down to two. That may have been the easy part because now I need projects to go with the yarn. 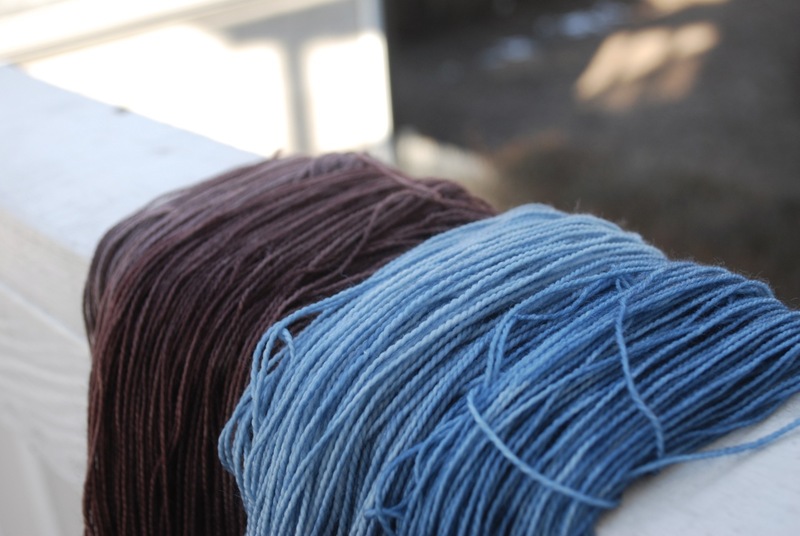 Which do you choose first - the yarn or the project? On Saturday I took a short trip up the road to Portland. Winter still lingers, but at least it wasn't stormy. The day was chilly with a stiff wind, and the sun was shining. 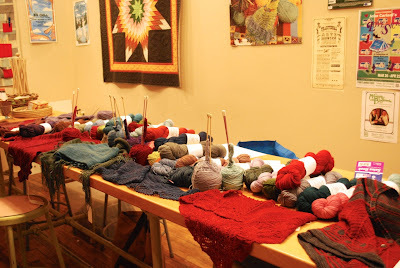 My destination was KnitWit Yarn Shop, and my mission was to serve up a yarn tasting. Suzie, the shop owner, has created a warm, welcoming space for knitters. KnitWit carries a variety of yarn, including a wide selection of Quince & Co. I set up a display on the large table in the back. The yarn tasting featured Bertha, Paula and Lillian with skeins available for knitting. It was a delightful afternoon with people trying on sample garments and pondering different colorways. It's always fun to help people move out of their color comfort zones. Before I knew it, it was time to close up shop. It was a great way to spend an afternoon, and I thoroughly enjoyed meeting some of the regulars at KnitWit. Suzie believes in supporting local fiber people. Her shop carries yarn from several New England-based businesses, and the staff is fun and helpful. If your travels take you to Portland, be sure to include a stop at KnitWit. After a rocky start Low Tide Cardigan is off the needles. Once I had sorted out my needle sizes and blocked the lace panels, the rest of the knitting flew by without a hitch. This design uses increases and decreases every other row to create front panels that drape and come to a point. I know you can't see that in this picture - it seems my daughters are always unavailable when I need a model. Follow the pattern link for additional pictures. 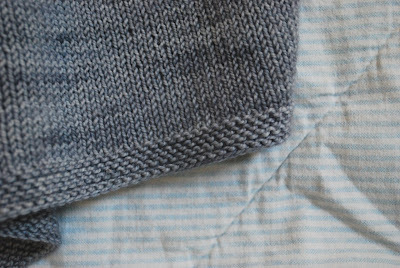 The effect is a lightweight, airy sweater perfect for spring and summer when you need a little something to throw over your shoulders. 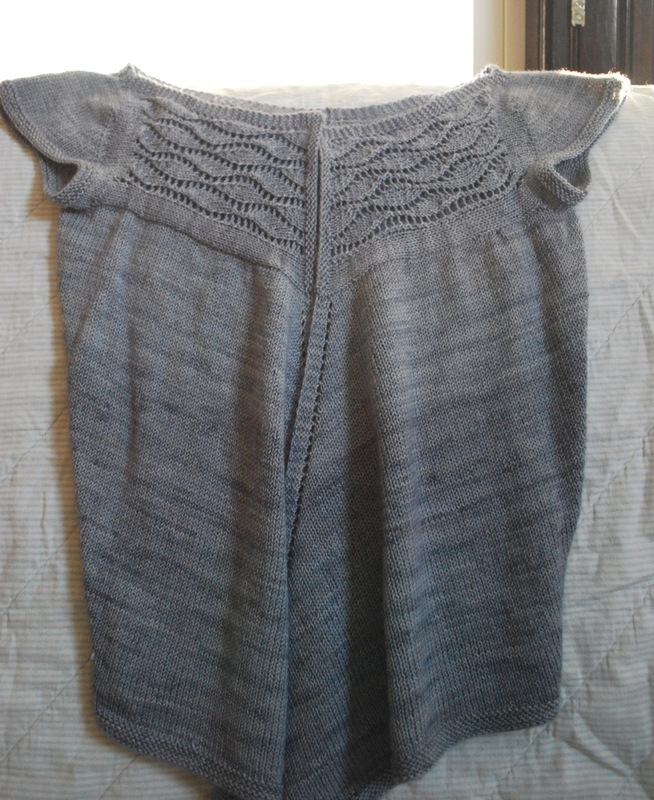 The one modification I made was a garter edge on the bottom and the sleeves instead of the rolled stockinette edge. 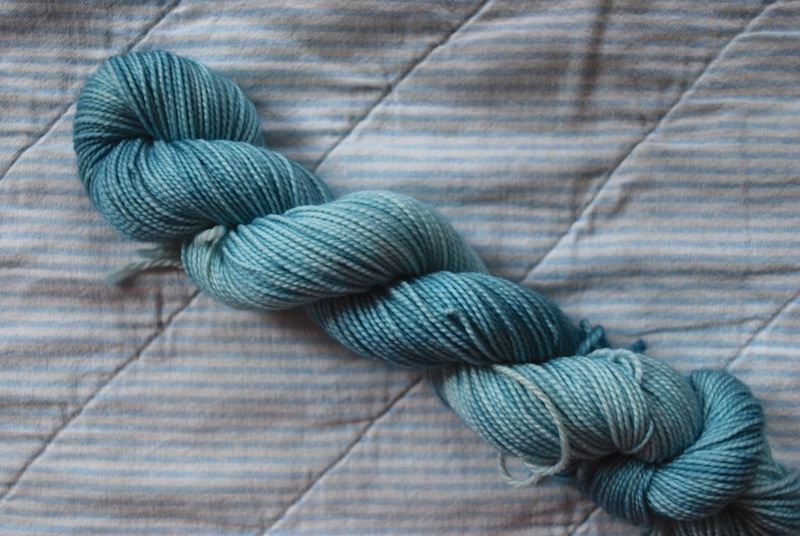 The yarn is Lillian in an as-yet-unnamed colorway. I have a Name That Color session scheduled for later today. I'm sure I can come up with something. The only other thing is to add the buttons, but I have them picked out and ready to go. That's the hardest part. While we wait for spring and sun, I've been on the lookout for bright, cheery colors. 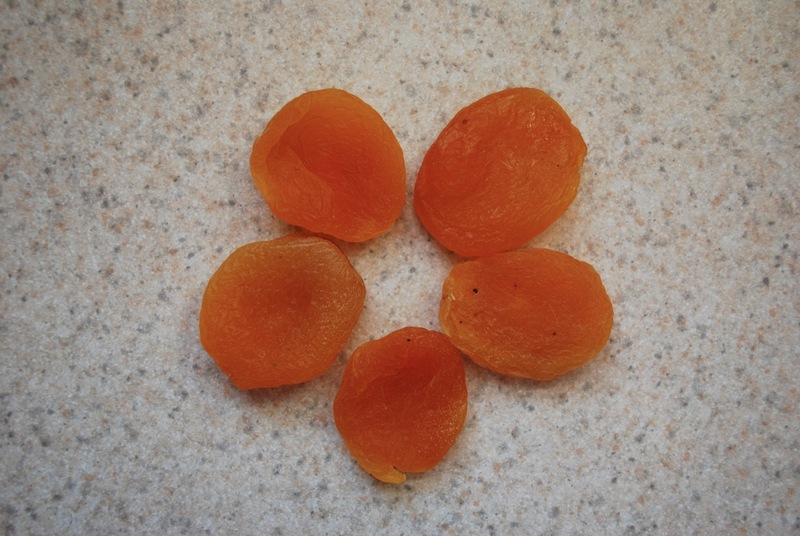 Apricots will brighten any day and are my color inspiration for the week. 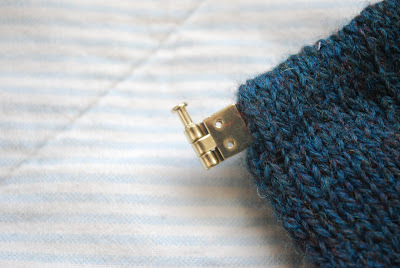 When my knitting students are debating what size sweater to knit, I share a little tip with them. Take a sweater that you wear regularly, fits well and is comfortable. Use the sweater as a template. Lay it out and measure across the bust. 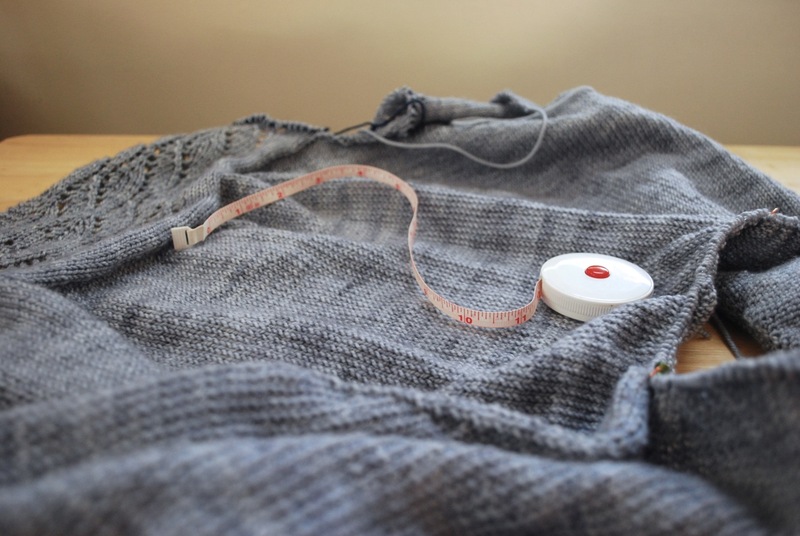 Based on this measurement you can pick the size for the new sweater. This method is also helpful in determining how long to make sleeves and how long to make the body of a sweater. 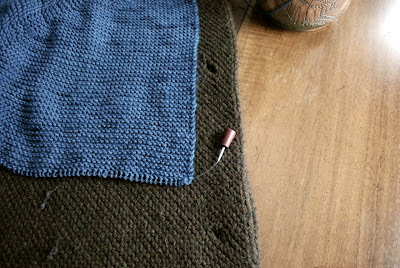 I have a sweater in progress that's been stalled. I wanted to modify it with a button but couldn't decide where to make the buttonhole, so I set it aside. The sweater had taken up residence on the couch not too far from my desk. Every day I would look at it, make a mental note to sort out the button issue and then promptly get distracted with something else. 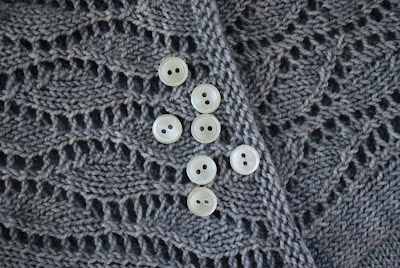 The other day it dawned on me that I could take a similar sweater with buttons and use it as a guide for the sweater under construction. 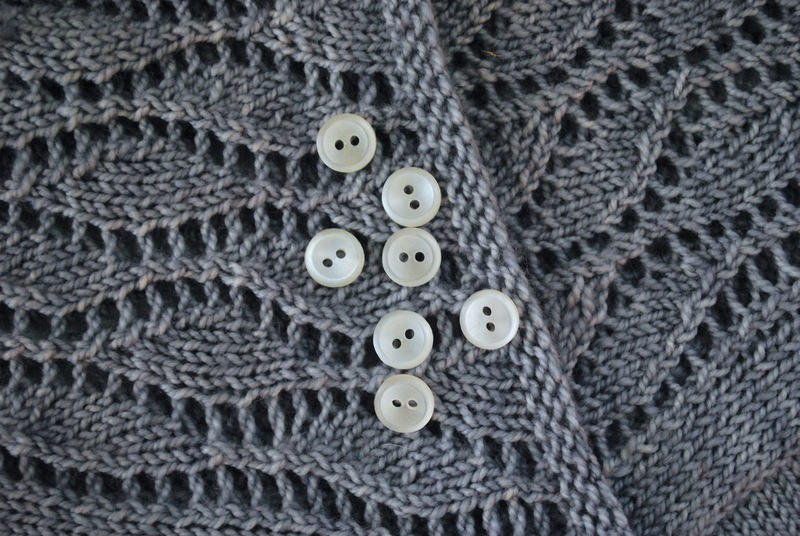 I decided I wanted one buttonhole that would fall between the two buttonholes on the brown sweater. It would appear that I stopped at just the right spot. Once I knew the buttonhole placement, I didn't waste any time. 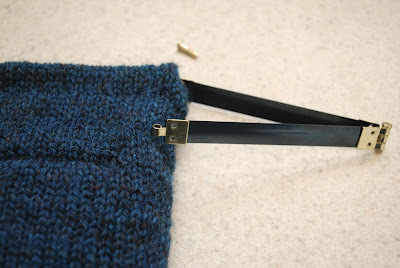 I constructed the buttonhole, and this project is back in action. Jumping over one little hurdle can make all the difference. 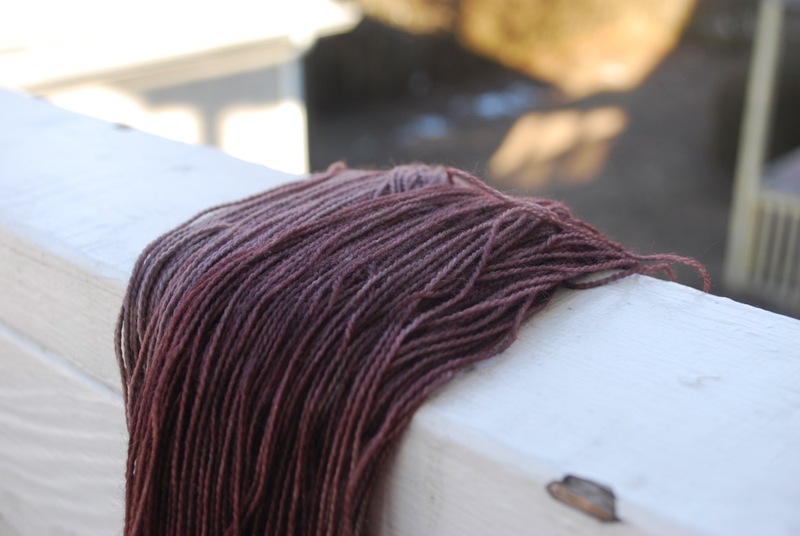 Every once in a while I get a request for custom dyeing, and it's always a fun exercise. I've been working on a custom request. 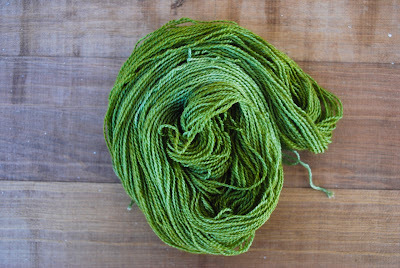 The yarn base is one I don't currently offer, but that's a bonus for me. It's a good opportunity to try a base I might offer in the future. I dyed several different colors including these two. While I wait for a color decision, I think I'll dye my own sample and give this base a test run. Spring is coming even though it doesn't feel like it today. I stepped out in the yard, and in less than three minutes I lost all feeling in my fingers. That will teach me to leave my mittens on the counter. 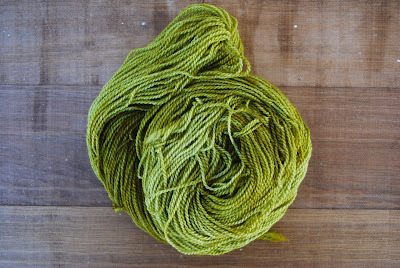 It may not be spring outside, but I've been brewing up a bit of spring in the dye pots. The run of events and festivals will be starting soon, and it's fun to have fresh colors to take along for the ride. 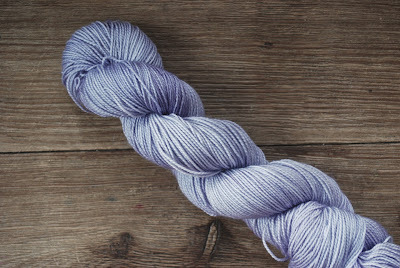 Sometimes I go back and look at colorways that have been on hiatus. Sometimes I recycle a colorway from one yarn base to another. 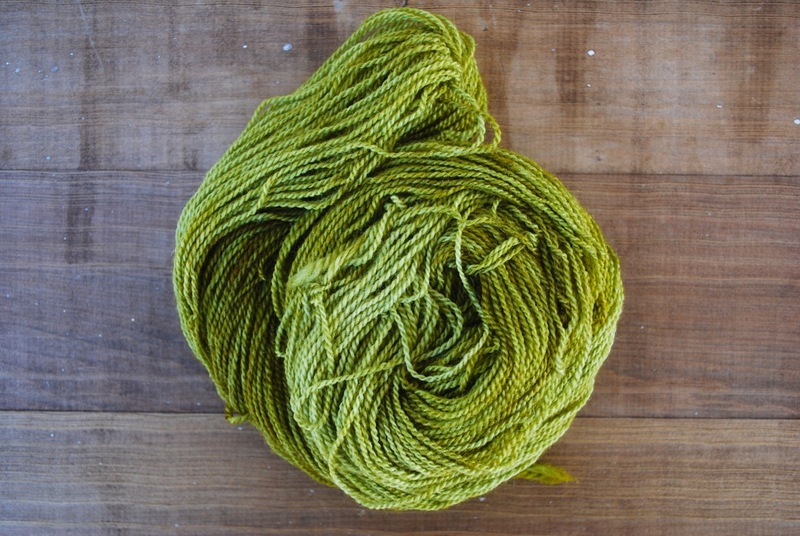 This is a favorite colorway from Mavis that I decided to give a trial run in Lillian. And I love it paired with this new blue. Maybe I can come up with a project for the duo. I'll have to let that idea simmer while I'm busy with the dye pots. 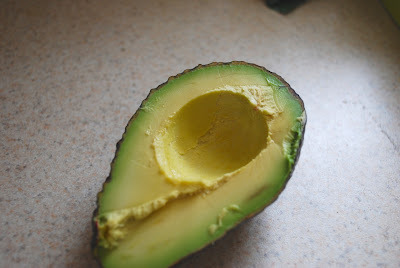 A fresh, ripe avocado . . . bright and cherry. My color inspiration this week. Yellow-green surrounded by a bright green border. Sometimes I have to hit the pause button on a knitting project. That's where I am with Low Tide. I'm closing in on the bottom edge and can't decide if I want to finish it off as written or maybe do something a little different. I thought checking other Low Tide projects on Ravelry would give me some insight, but my research findings are inconclusive. This is a booth sample. My self-imposed rule is to make the sample the way the pattern is written, but I'm toying with the idea of breaking my rule. Just this once. While I debate the situation, there's time to consider a bit of . . .
~ We're starting to see signs of spring all around. Snow piles are melting, and I've heard rumors of crocus in bloom. Flowers are a sure sign that the seasons are changing, so why not include a few of the yarn variety? Fork flowers require two ingredients - a fork and some yarn. The instructions say the project is suitable for ages 4 - 12, but I'm certain it would be just as entertaining for adults. ~ I love to leaf through the pages of Wild Fibers. The magazine is informative and shares a glimpse of fiber in faraway, remote places. For a look at the behind-the-scenes printing of the magazine, check out this interesting video. ~ Knitting and numbers. 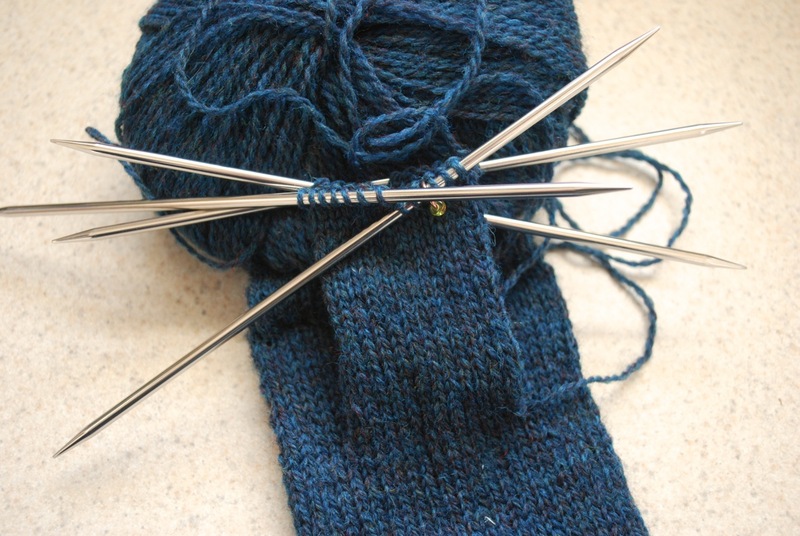 Knitting is all about numbers in so many different ways. If you appreciate numbers, take a look at the latest from Bristol Ivy for a new spin on statistics - The State of the Stock(inette) Market. Over a two week period Bristol compiled statistics on garment type, fabric type, yarn type, color and how garments were modeled based on the "Hot Right Now" patterns on Ravelry. It's interesting stuff, and I can't wait for the next installment. 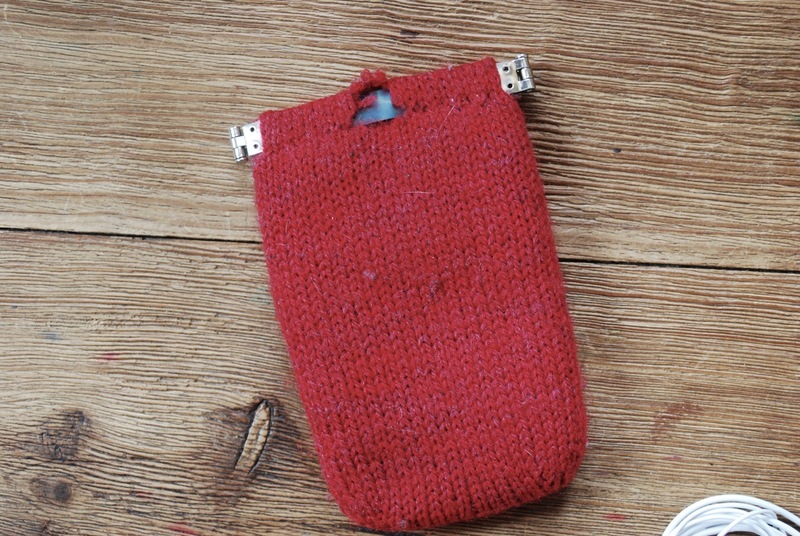 A few years ago I knit a case for my phone. I made in on a whim, not sure I would really like it or use it. Over the years I've become very attached to the little case. I use it all the time, and it shows. The phone case is now tattered and torn. Not too long ago my daughter told me, as only a teenager could, that I really should make a new one. Appearances are everything when you're that age. I didn't feel like taking time to knit a new one. And I wasn't sure I really needed one, but I tucked her recommendation in the back of my mind. Often I need a little time to warm up to the idea of replacing a favorite. A couple of weeks ago I agreed with my daughter that it was time to replace the sad, well-worn case. Once I'd made up my mind, it didn't take long to get the new case under construction. I used this pattern. The orange yarn will be unraveled to make room for the pocket. After the case is the right size from top to bottom, I worked an extra section on half the stitches. See red marking above. This extra section is used to form the top edge and the casing for the closure. 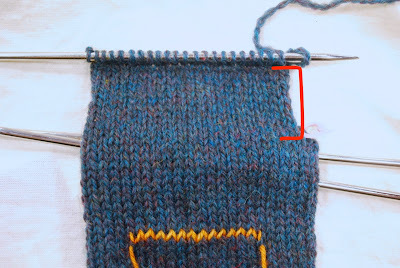 Stitches are picked up below the extra section (middle needle) and knit together with the live stitches above to form the casing. After both sides of the casing are finished, the stitches are worked in the around again to make the lining. When the lining is the right length, the stitches are grafted together at the end. The lining is tucked down inside the case. Next up . . . the pocket. I made this feature on my first case but didn't think I would really use it. Wrong. It's the most handy thing for my ear buds, and I don't know what I would do without it. 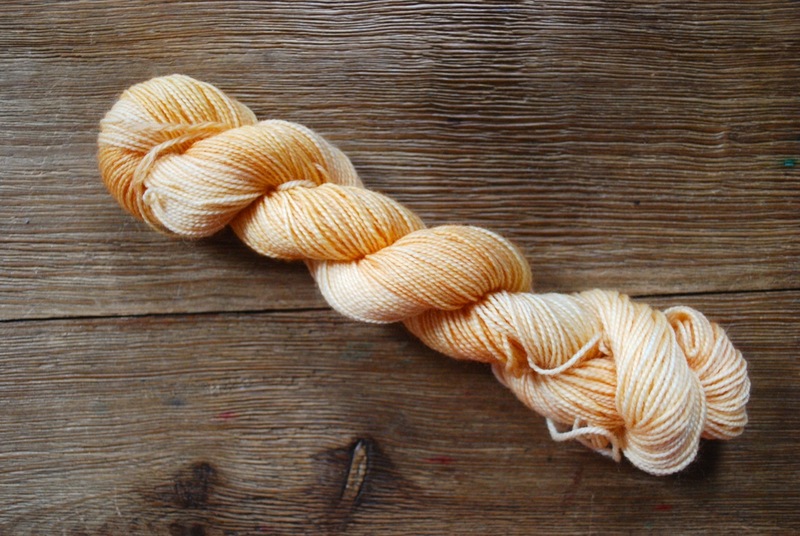 The orange yarn is removed. The exposed stitches are picked up and knit in the round to form the pocket. 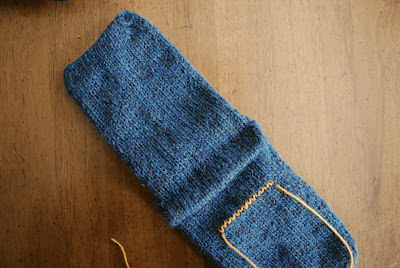 When the pocket is the right length (I made mine longer than the pattern suggests), the stitches are grafted together. 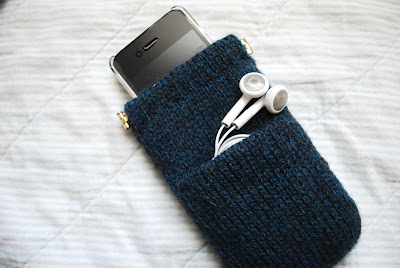 This little tube is tucked inside to create the pocket. The delightful detail about this case is the flexible closure at the top. The clasp is hinged on one end and open on the other end. Each end of the clasp is inserted through an opening in the casing. On the other end they are joined with a little pin. A new home for my phone. And now I can't imagine why I had trouble letting go of the old one. There's nothing more satisfying than putting a derailed knitting project back on track. I'll admit that often it's tempting to set the uncooperative project aside. Starting a new project is much more appealing. But if you can make it to the other side, it's well worth it. A few days ago I was tempted to set this project aside - but only for a moment. 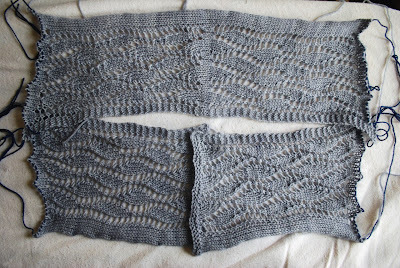 I had to knit one of the lace panels twice and take a blocking break, but now Low Tide is fully assembled. There's nothing but steady stockinette from here to the bottom edge. Over the coming weekend I have hours and hours of waiting time. I'm prepared. 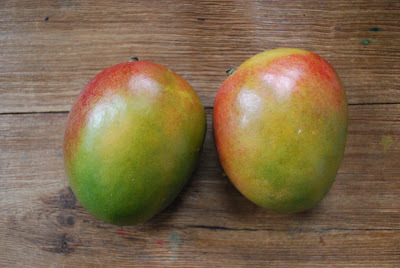 These shiny mangoes are my color inspiration the week. Bright green with a splash of red. The seasons are slowly shifting - more daylight, shrinking snow piles. But it's only March. If the howling wind today is any indication, winter is knocking on the door again. 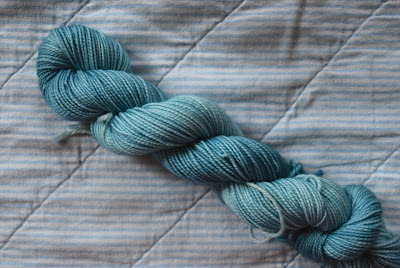 I've been busy dyeing and watching the March skies. And there are brighter, lighter colors. These new colors and more will debut later this month at KnitWit Yarn Shop in Portland. If you're in the area, stop by for a glimpse of spring. While The Lace Dries . . . I was cruising along on my Low Tide Cardigan when someone - that would be the designer - hit the pause button. 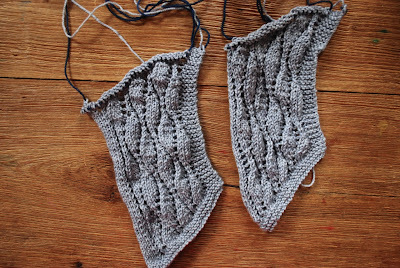 I finished the lace panels only to discover that they had to be blocked before I could move on to the next step. If I had been diligent and had read the pattern carefully before starting the project, this bit of blocking wouldn't have come as a surprise. I didn't want to lose my momentum, and for a brief moment I contemplated skipping the blocking step. Then I considered the consequences. I have to pick up stitches along the curled bottom edge of all the lace panels. 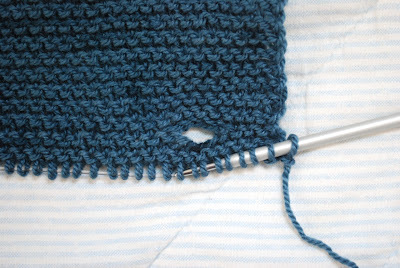 Picking up stitches would be much easier if the panels were blocked first. And so I did it. Then I had a small crisis on my hands. Low Tide was my only ongoing knitting project. What was I supposed to work on while the lace was drying? I had finished a pair of socks last week. Starting a new pair was the logical choice to fill the knitting void. 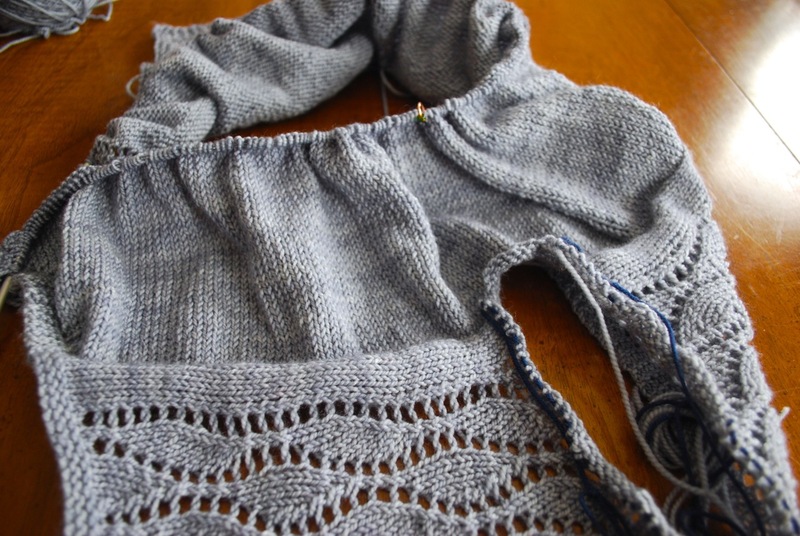 Sign of Four (a sock for Sherlock) is an enchanting combination of knit and purl sequences. It reminds me of the Dovetail Cowl I made not too long ago. 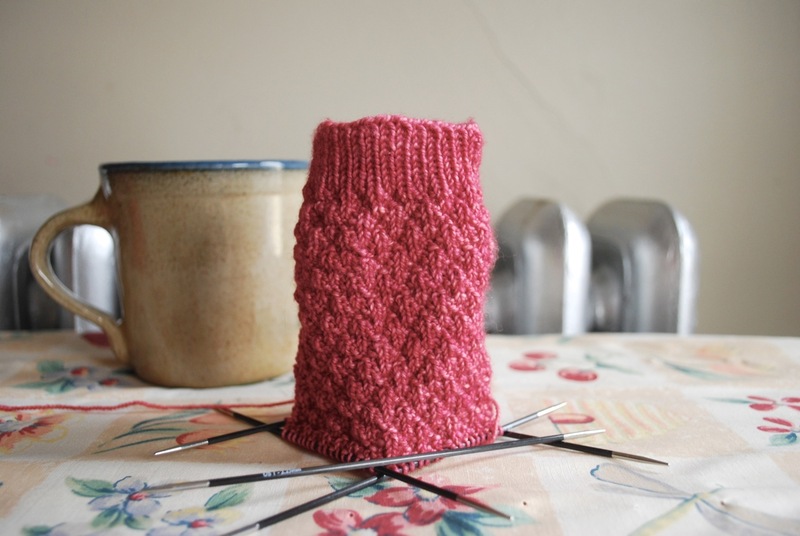 This sock kept me entertained during the blocking process. The leg is almost finished, and I'm on a roll. The only question is whether or not I can put it down. The lace panels are dry and ready for action. 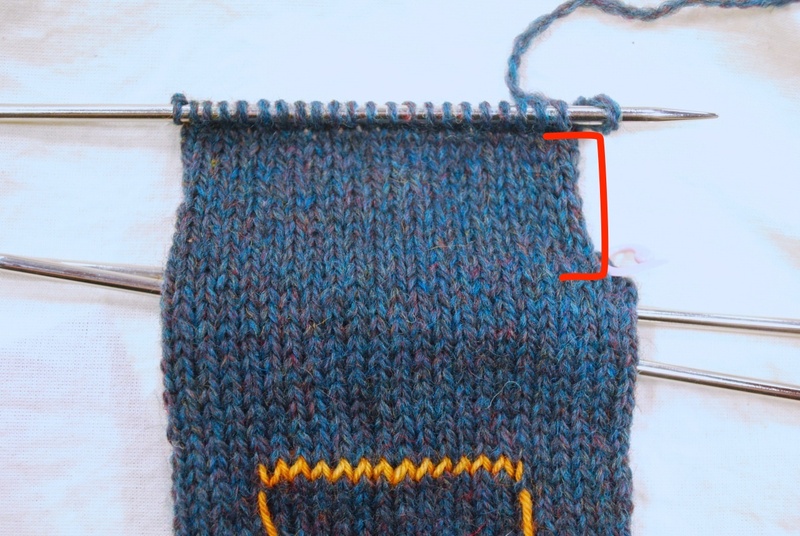 Sometimes problems arise with my knitting projects - the gauge is wrong, the stitch count is off, I misread the instructions. There are any number of problem possibilities. Some of them are minor and can easily be fixed. Others require more extensive remedies. When a project is progressing without a hitch, I feel that problems are lurking in the background, looking over my shoulder, waiting for an opportune moment to strike. I start to get nervous. Surely something will go wrong. That was my experience the other day. I had started a new project, Low Tide Cardigan. This design starts with three separate lace panels - right front, left front, back. The panels are all worked individually and then joined by working down the rest of the cardigan. The front lace panels start with a wee bit of garter worked on needles one size smaller than the rest of the sweater. 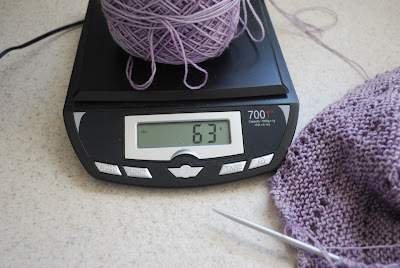 After the garter, the needle size changes for the rest of the panel. I'm working this project with interchangeable needles. I love the idea that I can swap out needle sizes just by changing the needle tips. In theory this is a good strategy, but I proved that something as easy as unscrewing and screwing can be challenging. Low Tide was moving right along. I had finished my first lace panel and was about to start the second one. Remember it starts with garter on smaller needles. 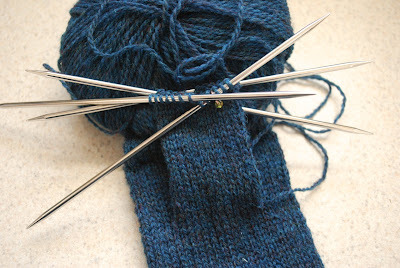 I was changing back to the smaller needle tips when that sinking feeling came over me. I had changed one of the tips, but when I measured the size of the tips, they were both the smaller size. How could that be? 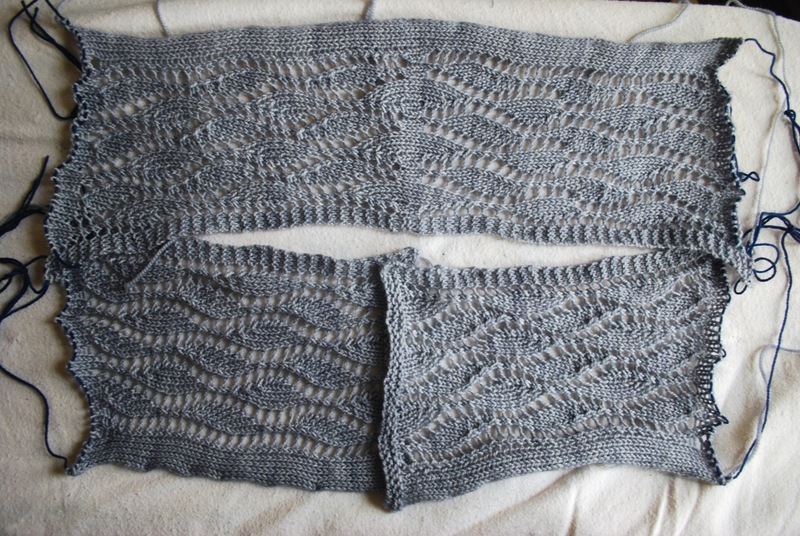 Unless I had knit the body of the first panel with two different size needles. Maybe I had already changed both of the needle tips before I checked the size. Maybe there was nothing to be concerned about. The only thing I knew for sure was that I was confused about which tips were used to work the lace. I examined the finished lace panel, hoping it would give me some sign that it had been worked with the right size needles. I held it close and turned it over, but there weren't any clues. Maybe I had worked the body of the panel with two different size needles, maybe not. This is the sort of problem that would nag me. I would always wonder, so I did a quick assessment and took action. The panel in question is small, so I knit a second one. And I made sure to check and double-check my needle sizes along the way. The panels are different sizes. 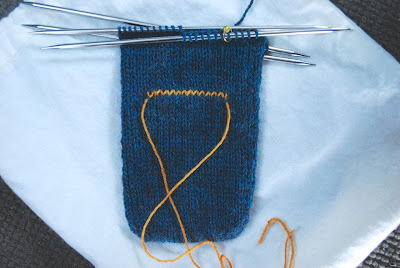 I had worked the first one with two different size needles. Now I have two right front panels, but the problem has been resolved. I can rest easy. For the moment. 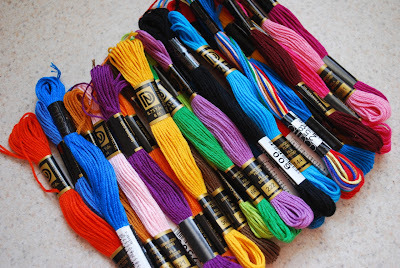 Friendship bracelets, embroidery floss, hours of fun. My color inspiration for the week.